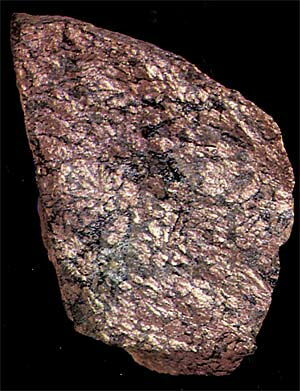 Nikeline (red nickeliferous pyrites) is an arsenate of nickel. Glance (glitter, glare) metallic, opaque. Colors light copper-red (from here the German name of copper nickel), grey oxide tint. A line is brown-black. Fracture, break padman, uneven. Fragile. Cleavage noperfect absolute. Appears in hydrothermal ore vein, lode, mines. Crystals (hexagonal Crystal structure) are very rare, more frequent dispersion, dissemination in ores, dense botryoidal aggregates. Important ore of nickel. Be found in the sulfide deposits of the Ore mountains (Germany, EU), Canada, CIS. Crystallizes in hexagonal Crystal structure. His crystals (pyramidal, little and often grouped) are the rarest find. Usually be found in dense the masses or as grains, dissipated in a gangue. Colors copper-yellow, gold light; on the fresh fracture of flash, but in course of time darkles usually. Chemical composition (chemistry, compound). Nickel (Ni) 43,9%, arsenic (As) 66,1%, admixtures: iron (Fe) to 2,7%, Sulphur, Sulfur, Brimstone (S) to 5%. Form of crystalline excretions. Crystals are very rare, usually mineral is presented dense the masses, sometimes by cluster-like and kidney-shaped reniform excretions, dendrites. Crystalline structure. Simple hexagonal lattice with the densest atomic packing. Class of symmetry. DiHexagonal-bipyramidal - 6/тmт. Cleavage. Distinct on a base and on a prism. Aggregates. Dense. Has a very low temperature of melting. In flame of gas-ring publishes the smell of garlic. Paints solution of aquafortis in a green color. Fuse melt on coal with formation of brilliant kinglet, an arsenic mirror appears in the closed glass tube. A behavior is in acids. Dissolves in HNO3 (apple-green mortar solution); a reaction on a nickel with a dimethylglyoxime gives pink, rose sediment. Be found in hydrothermal vein, lode, mines in a typical association with other of arsenide nickel, and also with the minerals of cobalt and silver. From the most notable deposits in Europe, in which found out Nikeline, will mark Eysleben in Tyuringii and Frayberg in Saxony (Germany, EU), and also Shladming in earth of Shtiriya (Austria). It is met also in Bu-Azzer (Morocco), in Anarake (Iran), in the district of Sadberi in the province of Ontario in Canada. 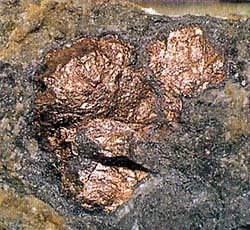 Nikeline - important ore mineral for the receipt preparation of nickel. Pentlandite (iron-nickel pyrites), is a sulfide of nickel and iron. Glance (glitter, glare) metallic, opaque. Colors darkly-bronze. A line is black. Fragile. Appears in magmatic deposits among the rocks of the first team in close accretions with Pyrrotine. Crystals (cube Crystal structure) are very rare; usually be found in joint, junction. Main base ore of nickel (Ni). 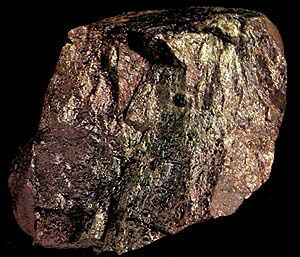 A brownish-yellow mineral consisting of an iron and nickel sulphide in cubic crystalline form: the principal ore of nickel. Formula: (Fe,Ni)S.
Deposit minefield mine field occurrence subsoil: in Canada, Norway, Sweden, CIS, Republic of South Africa. A standard is the dense Pyrrotine-Pentlandite aggregate from the deposit of Sadberi, province Ontario, Canada. In the organism of human people a nickel participates in oxidation-reduction, redox processes, breathing, blood formation, hematopoiesis, hematogenesis, diminishes the effects of adrenalin, rendering operating on the nervous system. In the organs of people of nickel most in a hepar, pancreas and hypophysis. A nickel is concentrated in the black matter of mesencephalon, answering in a cerebrum for emotions at surprises. A nickel is deposited in pancreas and parathyroid glands. A thyroid and adrenal gland contain the high concentrations of nickel. The table of contents of nickel with age is increased in lights. A nickel is needed: at high blood pressure, saccharine diabetes, asthenic states. On the influence on blood formation, hematopoiesis, hematogenesis a nickel is near to the cobalt. Nickel in combination with a cobalt, iron, participates a copper in the processes of blood formation, hematopoiesis, hematogenesis, and independently - in the exchange of fats, providing of cages oxygen. The biological role of nickel consists in participating in structural organization and functioning of basic cellular components is deoxyribonucleic acid, DNA and squirrel. Together with it, it plays a certain role and in the hormonal adjusting of organism. A nickel is oppressed by the action of adrenalin. Under influence of nickel twice the leadingout of corticosteroids increases with urine, the antidiuretic action of extract of hypophysis increases. A pancreas is rich in a nickel. At introduction after insulin of nickel the action of insulin is increased, glucopenia activity rises. It is considered that a nickel is the structural component of some enzymes. Displays of surplus of nickel are in an organism: increase of excitability of the central and vegetative nervous system, edemata of lights and brain, allergic reactions of skin and mucous membranes of overhead respiratory tracts (vitiligo, acquired leukoderma, piebald skin, dermatitis, Ringo et cetera), tachycardia; anaemias, decline of immune defence, increase of risk of development of new neoplasms in lights, buds, on a skin. From an organism a nickel hatches with faeces, excrements, stool, intestinal dischage (to 95%) and in negligible quantities with urine, then and by a bile. The table of contents of nickel rises at the heart attack of myocardium. The surplus entering organism of nickel can cause the depigmentation of skin (vitiligo, acquired leukoderma, piebald skin). The sulfur-containing amino acid, calcium, Sulphur, Sulfur, Brimstone, iron, zinc, selenium, vitamin of с behave to the antagonists of nickel (Nikeline is a arsenious nickel). Food sources: chocolate; nuts and seed: sesame, poppy, macadamia, almond, a nut is Brazilian, a walnut nut, seed of sunflower, pistachios, hazel filbert.